While the Aiken team is busy with the Woodside Festival of Homes, the Atlanta team is not to be outdone. Join us April 25-27th (yes, the same weekend!) 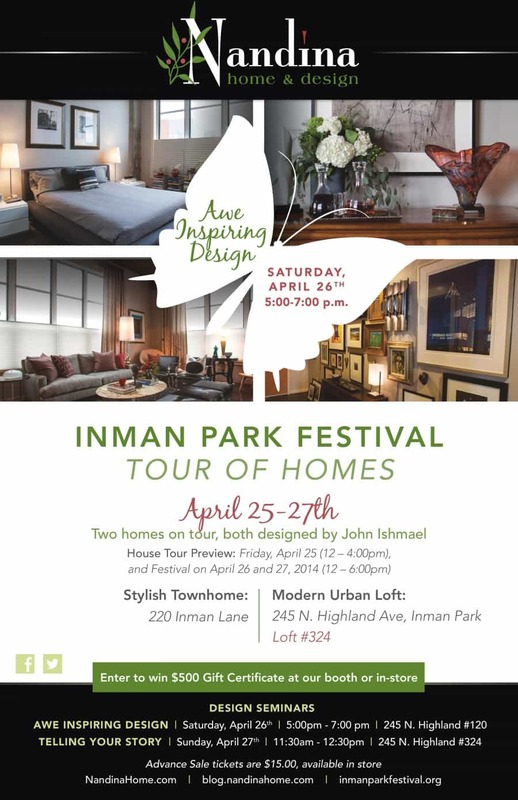 for the Inman Park Festival and Tour of Homes. Nandina owner and lead designer John Ishmael designed two of the homes on tour: an art-filled modern loft (conveniently right upstairs from the store), and a gorgeous townhome right around the corner. Although the fabulous festival is free for all to attend, the Tour of Homes requires a ticket. Advance Sale Tickets are $15, and available in the store. In addition, this ticket is your invite to the Nandina Design Seminars. Finish your tour at our showroom for cocktails & hors d’oeuvres and learn inside tips from our fabulous design team. From the magic of reupholstery to the art of accessorizing, you’ll be sure to pick up some clever ideas to transform any space into the home of your dreams. Begin your tour at 245 N. Highland #324 for coffee & donuts and learn from designer John Ishmael how to tell your story through interior design. This urban loft is filled with amazing artwork, intriguing collectables and modern furnishings that reflect the owner’s unique style. During the festival, we’re also going to have a Nandina booth set up – right across from the trolley barn on Edgewood. If stopping by the booth or store to see our smiling faces isn’t enough of an incentive, we have another one for you: a chance to win a $500 gift certificate. You can only enter to win during the festival, so don’t miss it! For more information about the festival and tour, visit the official website or feel free to give us a call!